On Monday Charity and I went to see "Get Smart" with Steve Carell and it was pretty funny. The first 30-35 min was pretty tough, kinda like the office. The scenes were great but it was that akward feeling just like watching the office. All in all it was a good flick. There wasn't much sexual stuff and not much cussing, the movie is not a must see but worth it. She is just straight cute right now! I cant wait to be a dad! This is the pic from 28ish weeks ultrasound. This week will be 30 weeks, that is 75% of the way done. "I am going to sit around tonight and see how many girls I can get to hug me. Last year I got 63"
I am not sure why that made me laugh so hard. Just a glimpse into the mind of a fourteen year old boy. Today I had breakfast with a mentor of mine that I really look up too. His name is Rob Hall. He hired me in my current position and now he works at an amazing church in The Bay Area called: "Central Pennisula Church". Rob Hall loves Jesus and really loves his family. I look up to him and the way he balances life and loves people. Today at breakfast he gave me a list called: "New Dad Top 10"
1. Never stop dating your wife, just plan now to pay a babysitter! 3. Give your wife time off! Let her out by herself from time to time. 4. Pray with & for your children from day one. 5. Read the Word with & to your children from day one. 7. With a new baby, your ministry will change...for the better! Parents will respect you more & you'll have to find a better "balance". 8. Say "NO" more often to ministry stuff & life things. You'll need to be home more. 9. Enjoy every moment & season with your kids, they grow up fast. 10. Travel with your kids, its so much fun! 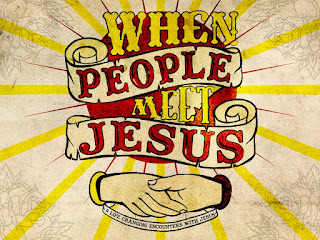 So last night we started the series: "When People Meet Jesus" by Doug Fields. It was super sweet. It helps to have the graphics and notesheets the have done and be able to put your own stories to it. We ended the message with a chance to receive Jesus and two girls re-commited and one guy gave his life to Jesus for the first time. It was super exciting! I love working with students. I am glad I waited to write this till today. This week has shown me how much we all need community and the relationships of others. On Sunday my wife had her small group girls over for a luau party to start off summer and encourage one of our other leaders who is moving. Seeing the girls connect was amazing! I normally would not be there, but they needed someone to cook. Then I went and played video games. That night we went over to a leaders house and played some volleyball. It was super sick. Seeing people connect with each other. This time was more for our college students but some of them are our leaders and it was just fun. Not only playing volleyball but connecting with other people from our church was great for me. I noticed, once again, my need for community and how people thrive in that. Finally, on Tuesday I had small group with my boys. I have Junior and Senior boys so half of my boys are graduating. Hearing my boys just share their hearts to each other is so amazing. They have learned accountability early and it blows my mind. I wish that I had the relationships that they have when I was 17. All this said, it made me think that we all need this. We need to pour into others, have people we can laugh with and have people we can share our junk with and pray with. On Friday night Charity and I went to Valley of Fire. Its a place that is like an hour or so from our house and is is amazing. This place has all these crazy red rocks and some super sweet formations. We went out there and walked around just a bit. We saw this petrified tree that was super crazy. I have to say that I do hate the signs that say: "This tree is millions of years old." Not sure why do that. After our little hike action we found a campsite and roasted marshmallows and made some smores. Then we laid out a blanket and just took some time to star watch. I think we all need to just take some time to watch the stars with someone who means the world to us. We needed that time to just chill and be with each other.